Hi Fi Writer - What is 'anamorphic video'? While this discussion is focused on PAL DVDs, it equally applies to NTSC DVDs available in various parts of the world, notably the United States, except that the maximum vertical resolution for NTSC is 480 lines. DVD has injected a number of new terms into Australian's homes. Perhaps the most esoteric of them all is 'Anamorphic' (also known as 'enhanced for widescreen TVs' and '16:9 enhanced'). What does it mean? And what difference does it make to the DVD viewer? A DVD designed to work on our PAL TV system stores its movie as a series of heavily compressed still images, each of which is composed of 576 horizontal lines. This matches the displayable image on a PAL TV. A standard TV-style 4:3 picture uses all 576 lines. But most DVDs have a widescreen aspect ratio of 1.85:1 or 2.35:1. The first only uses around 414 lines for the picture, with the rest just encoded in black. With 2.35:1, things get worse. MGM's non-anamorphic The Great Escape uses only 322 lines -- just 56% of what the format is capable of holding. To make use of this otherwise wasted space, an anamorphic widescreen DVD vertically stretches the picture by one third during transfer to DVD so that it uses a bigger chunk of the available storage space. 'Standard' or '4:3' in pan and scan mode. I shall ignore the last one here, because it requires a whole article in itself to explain. If you leave the setting at 16:9, then the picture will display correctly on a widescreen TV (Figure 1). But on a 4:3 TV the picture will be tall and skinny (Figure 2). If you select '4:3' mode, the DVD player will reformat the picture, reducing its height by 25% and inserting black bars at the top and bottom (Figure 3). Not all widescreen DVDs are encoded in anamorphic format. Those that aren't include the Region 4 versions of The Interview, Death Becomes Her, Out of Sight, Rob Roy and Titanic. The DVD menu setting has no affect upon these movies. It just assumes that they are normal 4:3 movies ... which they are, except with whopping thick black lines across the top and bottom! Does anamorphic matter? That depends on what kind of TV you have. A non-anamorphic movie may look slightly better on a 4:3 TV because the transfer has been optimised for the display. But the 4:3 TV is part of a dying breed -- even if it doesn't quite recognise it yet. Australian Digital TV is gradually coming on-stream, and this is primarily in widescreen format. You can be confident that nearly all TVs sold by the end of this decade will be in widescreen format. Already widescreen prices are falling. Widescreen TVs universally offer a 'zoom' feature of some kind that will take a letterboxed widescreen movie and expand it to fill the screen. But what these can't do is improve the picture's resolution. For example, look at the two nearly identical screen shots. They are both details of the same frame of Toy Story 2 (which is anamorphically encoded, by the way). Figure 4 was played back with the DVD player set to 16:9, and Figure 5 with it set to 4:3. Notice how the 16:9 version is sharper than the other one? That's thanks to it containing 33% more information. While a non-anamorphic DVD may suit your current 4:3 TV, how will it look when you upgrade in the future? How can you know whether a DVD is anamorphic? Even if you have a 4:3 TV, you can just switch your DVD player's setup menu to 16:9 mode and then play a bit of the movie. If the characters are tall and skinny, the movie is anamorphic. Telling from the back of the box, though, before you hand over your money can be difficult. 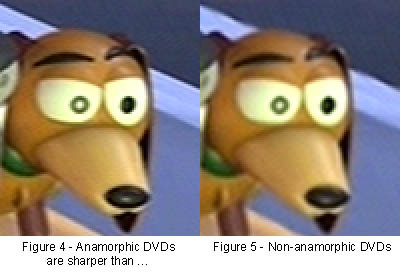 Few DVD distributors use the word 'anamorphic' on their boxes. Look through the fine print for something like '16:9 Transfer' (as opposed to '4:3 Transfer') or '16:9 Enhanced' or 'Enhanced for Widescreen'. Unfortunately, sometimes the covers are mistaken. Thus Scent of a Woman claims to be '16:9 enhanced' but isn't, the original release of A Fish Called Wanda has '16:9 Anamorphic Stretch' printed on the cover, but it isn't. If you do have a choice, go for anamorphic. It will look noticeably better with your forthcoming widescreen TV.